Before you can set up your mobile business for subscriptions, you need to have a clear understanding of how you are performing today. We like to look at data from a Lifecycle perspective to really get to know users. That allows you to do much more focused and relevant marketing, which in turn helps drive conversion. For instance funnel reports give you a view of where people ‘fall off’ within common workflows, so that you can focus on those areas and do something about it. It’s also important to segment users based on their behavior, so that you can interact with them in the most relevant way. You must have this step in place in order to take advantage of the following points! Onboarding is crucial when it comes to converting a user into a paying subscriber, so make sure you are good at it - it’s the key to everything! Surprisingly, the best time to convert a user into a paying subscriber is often the first time they open the app, even if only by beginning the process through a free trial. Either way, it is essential to deliver a stand-alone onboarding process that introduces new users to the app and ‘sells’ your service as effectively as possible.This can be a tremendous amount of work, and in particular a tremendous amount of work to change; a typical sprint takes about 3 months after all. However, the major mobile-first companies do not go the hard-coding route - they optimise and prototype native onboarding on-the-fly without having to re-release to the app store. This saves a huge amount of time, and enables you to take action in real-time, when it matters. What are the moments to interact with users that will help drive conversion? This is something to mull over and make sure you get right. For example, if a user saves their 100th note in a note-saving app, you probably know it is a good time to try and convert. 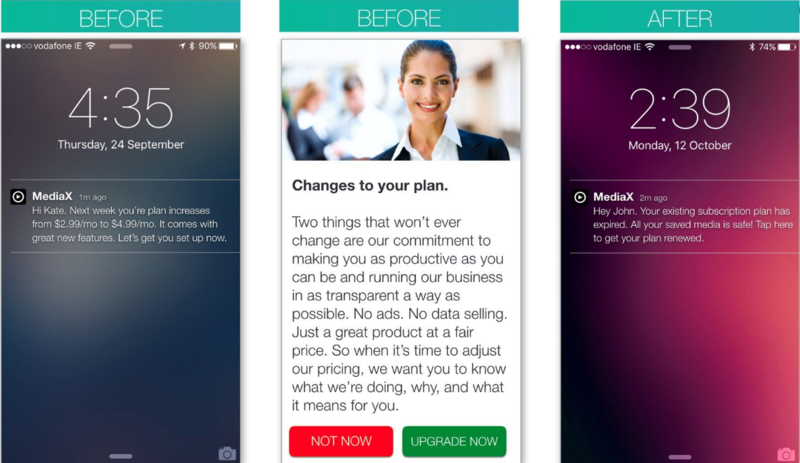 Interact in that moment with an in-app message to prompt upgrade to premium. Make it as simple as possible: one option that can be initiated with one touch. As you read about in the last post, removal of friction improves conversion. A/B test different variants to find the most successful variant and make sure that you aren’t damaging your business with bad messaging. Lots of subscription apps use an in-app store to display various purchase options. It can be tempting to offer the user more options, particularly with iOS 10’s changes in relation to this. However, we find that simple is best when it comes to these screens, and the fewer options available, the more successful conversion will be. Conversion rates plummet with any kind of complexity. Of course there’s no need to guess: optimize your in-app store by A/B testing different price plans and layouts, to determine which ones generate the most revenue. The games industry has been incredibly successful by making most of their money from a relatively small percentage of their overall users, sometimes known as ‘whales’. Whales are the power users of the app who pay lots (and lots) of money. Rather than using the in-app store, it makes more sense to target your power users with bespoke in-app messages. This way you can offer them a high-value package that isn’t normally available to other users, and maximizes potential revenue from these all-important users. The onus should be on you to communicate any price changes, and this should be done well in advance, in the days and weeks approaching the upgrade of your pricing. Because you are communicating with the users, not Apple, you can do certain things to increase engagement such as sending a push notification at the optimal time for each customer based on their unique usage; personalizing the message, by doing something simple like using their first name; and making it contextual, showing that you know what price plan they are on. Communicate with users in-app as well, which allows a deeper explanation and an option to ‘upgrade now’. With an analytics system in place it is possible to see which users have not chosen to upgrade, and will effectively churn when the subscription runs out. You can target them with retention campaigns to help prevent them from doing so. Every time one of our clients localizes to the territory of the user, engagement jumps at least 50%. It’s really easy to do, as their app settings will tell you what language they use. There’s no excuse not to! It can’t be said often enough: churn kills subscription businesses, so make sure you track it! More than this though, find out why churn is happening. Ask users for feedback when they are unsubscribing, because it has the potential to save you a huge amount of money. One of our publishing customers used an in-app survey when they were experiencing substantial churn, and it turned out that users felt the app was getting too large once a number of issues were saved on their phone. When it comes to storage issues, and the choice of getting rid of an app or pictures of your daughter, there is only going to be one winner. That one survey saved the company about $250,000 in churn. It is also important to find out what new users think about the app too. Get their feedback to see if they are happy, unhappy or confused with a multi-choice in-app message. Getting happy users to rate your app is the simplest and most effective way to improve your app store rating to 4.5 or 5 stars. Equally important, as we’ve already seen, is getting feedback from unhappy users to find out how you can improve your app and fix the pain. So there we have it! These are interesting times, and these changes have the potential to help you build your app into a long-term, sustainable business. However, you need to think about it, and implement your strategy correctly in order to fully exploit it.